This article is about the section of Interstate 80 in Utah. For the entire route, see Interstate 80. Interstate 80 (I-80) is a part of the Interstate Highway System that runs from San Francisco, California, to Teaneck, New Jersey. The portion of the highway in the U.S. state of Utah is 196.35-mile-long (315.99 km), through the northern part of the state. From west to east, I-80 crosses the state line from Nevada in Tooele County and traverses the Bonneville Salt Flats—which are a part of the larger Great Salt Lake Desert. It continues alongside the Wendover Cut-off—the corridor of the former Victory Highway—U.S. Route 40 (US-40) and the Western Pacific Railroad Feather River Route. After passing the Oquirrh Mountains, I-80 enters the Salt Lake Valley and Salt Lake County. A short portion of the freeway is concurrent with I-15 through Downtown Salt Lake City. At the Spaghetti Bowl, I-80 turns east again into the mouth of Parley's Canyon and Summit County, travels through the mountain range and intersects the eastern end of I-84 near Echo Reservoir before turning northeast towards the Wyoming border near Evanston. I-80 was built along the corridor of the Lincoln Highway and the Mormon Trail through the Wasatch Range. The easternmost section also follows the historical routes of the First Transcontinental Railroad and US-30S. Construction of the controlled-access highway began in the 1950s, and by the late 1970s most of the freeway across the state of Utah had been completed. The four-and-a-half-mile-long (7.2 km) section of I-80 between Utah State Route 68 (SR-68, Redwood Road) and the Salt Lake City International Airport was the last piece of the nearly 2,900-mile-long (4,700 km) freeway to be completed. It was opened on August 22, 1986, and was about 50 miles (80 km) from the site of another cross-country milestone in Utah, the driving of the Golden Spike of the First Transcontinental Railroad at Promontory Summit. Average daily traffic volumes in 2012 ranged between 6,765 vehicles using the freeway at SR-58 and 121,205 vehicles using the freeway at the Spaghetti Bowl in Downtown Salt Lake City. Throughout the state, the highway is also known as the Purple Heart Trail. Out of the eleven states which I-80 passes through, the 196.34-mile-long (315.98 km) segment in Utah is the fourth shortest. The longest stretch of I-80 in a single state is the 455.32-mile-long (732.77 km) segment in Nebraska. As part of the Interstate Highway System, the entire route is listed on the National Highway System, a system of roads that are important to the nation's economy, defense, and mobility. Every year, the Utah Department of Transportation (UDOT) conducts a series of surveys on its highways to measure traffic volumes. This measure is expressed in terms of average annual daily traffic (AADT), a measure of traffic volume for any average day of the year. In 2012, UDOT calculated that as few as 6,765 vehicles traveled I-80 at the interchange with SR-58 in Wendover, and as many as 121,205 vehicles used the highway at the Spaghetti Bowl in downtown Salt Lake City. Between seven and 58 percent of the traffic recorded consisted of trucks. These counts are for the portion of the freeway in Utah. The freeway enters Utah from Nevada in the city of Wendover on the edge of the Bonneville Salt Flats. The cities of West Wendover, Nevada and Wendover are accessible by I-80's only business loop in Utah, whose interchange is just south of Danger Cave. The highway closely follows the historical routes of the Wendover Cutoff, the Victory Highway, and of the ex-Western Pacific Railroad's Feather River Route (now part of the Union Pacific Railroad Central Corridor) across the salt flats and the larger Great Salt Lake Desert. Bonneville Speedway, home to many land speed records, is accessible from I-80. In the middle of the salt flats is a concrete sculpture, Metaphor: The Tree of Utah, which stands just off the westbound carriageway of I-80, 30 mi (48 km) east of Wendover. Bounded on each sides by military training grounds, the I-80 corridor is overflown by commercial airliners traveling west from Salt Lake City International Airport. The freeway veers north around the Cedar Mountains in a small gap between them and the Lakeside Mountains. Further east, the highway passes the Stansbury Mountains, which are located in the Wasatch-Cache National Forest. After the mountain ranges, the freeway arrives at the southern shore of the Great Salt Lake and closely follows the shore towards the western suburbs of Salt Lake City. However, the historical routes from which the route of I-80 was derived were routed further from the lake, passing through the towns of Grantsville and Tooele; these communities are now served by SR-138 and SR-36 respectively. After an interchange with SR-36 at Stansbury Park, the highway crosses a bottleneck between the Oquirrh Mountains and the Great Salt Lake. While traversing the neck, views can be had from I-80 of the Lake and Antelope Island. After passing the neck, the road forks, with I-80 proceeding towards the north end of Salt Lake City and SR-201 proceeding towards the south end. Historically, this intersection was the separation of US-40 and US-50. After the intersection, the freeway corridor is again bottlenecked with the Great Salt Lake to the north and the Kennecott Copper smelter and tailings pond to the south. The Kennecott's Bingham Canyon Mine, which was once considered to be the largest open-pit copper mine, can be seen in the distance. The 1,215-foot-tall (370 m) Kennecott Smokestack is one of the tallest freestanding structures in the United States. Along this portion, the freeway passes the historical site of the Saltair Resort. The freeway enters the Salt Lake Valley on the former alignment of North Temple Street until it passes the Salt Lake City International Airport, where the freeway veers slightly south and leaves the North Temple Street corridor which leads to Temple Square in downtown Salt Lake City. The Green Line of the Utah Transit Authority (UTA) TRAX system briefly parallels I-80 before traveling down the center of North Temple Street. I-80 becomes concurrent with I-15 after interchanges with SR-58 and 600 South and continues south for about three miles (4.8 km), passing along the western and southern edges of downtown Salt Lake City. The southern interchange with I-15, which also includes SR-201 (21st South Freeway) and marks the end of the concurrency, is known as the Spaghetti Bowl,. In the southwestern corner of the Spaghetti Bowl is another portion of the UTA TRAX Green Line as it travels towards West Valley City. After separating from I-15, the freeway continues easterly through South Salt Lake, loosely following an alignment just south of 2100 South and the UTA S Line streetcar through the Sugar House neighborhood and past Sugar House Park—once the home of the Sugar House Prison towards the clockwise terminus of the I-215 270° belt route around Salt Lake. It continues through Parley's Canyon, where the freeway joins the historical route of the Lincoln Highway. Between the mouth of the canyon and the Summit county line, the route re-enters the Wasatch National Forest. Parley's Canyon carries I-80 up the western slope of the Wasatch Front as a six-lane freeway, cresting the mountains at an elevation of 7,028 feet (2,142 m) at Parley's Summit. Both the canyon and summit were named for Parley P. Pratt, an early settler to the Salt Lake Valley and an early Mormon leader who was asked to survey a new route across the mountains to replace the route through Emigration Canyon. Between 1848 and 1851, Pratt surveyed, completed, and operated the Golden Pass toll road through the canyon that today bears his name. Pratt had unsuccessfully solicited for $800 (equivalent to $19 thousand in 2018) to build the road, and sold it for $1,500 (equivalent to $37 thousand in 2018). On and off ramps for the Wyoming port-of-entry are located just within Utah. In January 2014, UDOT introduced variable speed limits to I-80 in Parley's Canyon, allowing a speed limit between 35 mph (56 km/h) up to the normal 65 mph (105 km/h) depending on weather or traffic conditions. Beyond Parley's summit lies Park City, a mining town today better known for its many ski resorts. 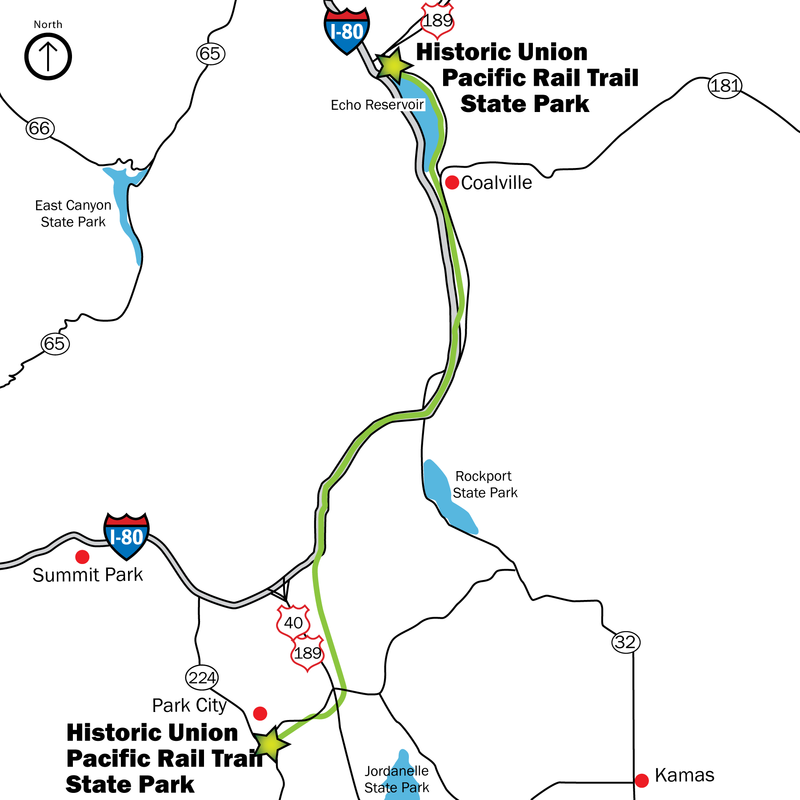 The Historic Union Pacific Rail Trail State Park travels in the median between carriageways of I-80 before paralleling the highway until the southern end of Echo Reservoir. The freeway turns north upon reaching the Rockport Reservoir at Wanship following the tributaries of the Weber River toward Echo Reservoir and dam. 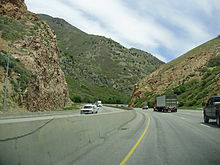 Upon reaching Echo Canyon and the junction with the eastern terminus of the western section of I-84, the freeway follows the canyon east until it reaches the Wyoming state line near Evanston. I-80 forms the northeastern border between Rich and Summit Counties. The portion through Echo Canyon follows the historical routes of the Mormon Trail, US-30S, and the First Transcontinental Railroad. A rest area in the canyon just east of the junction with I-84 features signs pointing out features that were obstacles for both the Mormon pioneers and the railroad construction workers, including Pulpit Rock, which was partially demolished when the I-80 was built through the canyon. I-80 eastbound across the Bonneville Salt Flats. I-80 follows the routes of two major auto trails through the state. In western Utah, I-80 follows the historical route of the Victory Highway from Wendover at the Nevada state line to the junction of US-40 near Park City. Throughout Utah, I-80 is signed as the modern route of the Lincoln Highway—except through Salt Lake City, where the Lincoln Highway is routed along State Route 201 and Parley's Way. The route of the Lincoln Highway across Utah was generally derived from the route of the Pony Express and the Central Overland Route. However, much of the original route of the Lincoln Highway west of Salt Lake City is inaccessible. The original route of the Lincoln Highway proceeded southwest from Tooele towards Ely, Nevada. This area is now used for military bases, such as the Dugway Proving Ground and Tooele Army Depot. The area was closed to the public when these bases were established. I-80 and US-93 are the modern signing of the Lincoln Highway between those two cities. East of Salt Lake City, I-80 closely parallels the original route of the Lincoln Highway. In 1926, much of the route covered by I-80, including Pratt's former toll road from the Nevada state line into Salt Lake City, was signed as US-40 then as US-30 to the Wyoming state line. It was also part of the Victory Highway west of Salt Lake and the Lincoln Highway east of Salt Lake at this time. Most of the route had been improved but some stretches of graded road remained. In 1937, parts of the route near Wanship were numbered US-530. In 1950, the highway near Echo was designated US-30S and US-189. By 1959, US-50 Alternate was also routed along the western portion of I-80. The first Utah State Route to have the number 80 is now known as SR-92, which was originally numbered SR-80 until the 1977 renumbering of Utah State highways. Previously, the freeway's legislative designation was SR-2. Passage of the Federal Aid Highway Act of 1956 formed the Interstate Highway System, and the I-80 number was first designated to a then-unconstructed controlled-access highway across the state by 1957. I-80 was constructed in segments, starting in the late 1950s. By the late 1970s, the Utah portion of I-80—except for a gap on the western edge of Salt Lake City—was largely complete. A four-and-a-half-mile-long (7.2 km) section between Redwood Road and Salt Lake City International Airport holds the distinction of being the final link of the transcontinental freeway to be completed. As an Interstate Highway, design specifications require a controlled-access highway with no at-grade intersections. This section was dedicated on August 22, 1986, and was the last to be completed to Interstate Highway specifications along the almost 2,900-mile-long (4,700 km) route of I-80 between San Francisco, California and Teaneck, New Jersey. The section was completed close to the thirtieth anniversary of the Interstate Highway System, which was noted at the dedication and considered to be a milestone in the history of highway construction in the United States. It was also noted at the dedication that this was only 50 miles (80 km) south of Promontory Summit, where the golden spike of the United States First Transcontinental Railroad was laid. The original designation of I-84, which begins at an interchange with I-80 in Echo, was I-80N. This designation was changed to I-84 in 1977 by the American Association of State Highway and Transportation Officials despite objections from the Washington State Department of Transportation and the Idaho Transportation Department, and with the support of UDOT and the Oregon Department of Transportation. The legislative designation for this highway was SR-3 until the 1977 renumbering. Rebuilding of the first portions of I-80 began in October 1990 with a one-point-four-mile-long (2.3 km) stretch near Redwood Road in Salt Lake City. By 1991, UDOT estimated that the reconstruction of all federally funded highways in the state would cost up to $4.3 billion (equivalent to $7.21 billion in 2018). The Spaghetti Bowl interchange was first proposed in 1996 to accommodate traffic for the 2002 Winter Olympics being held in the city. Most of the Spaghetti Bowl was open by November 2000; the remainder opened in early 2001. In 2002, the Utah State Legislature named the highway the Purple Heart trail, in honor of wounded war veterans. Additional reconstruction work—which involved replacing most of the bridges along the route, resurfacing and installation of sound barriers—was done on I-80 between the Spaghetti Bowl and Parley's Canyon in 2007 and 2008. 209.857 131 Rock Quarry Road No westbound exit; signed only as "Exit 131"
^ I-80 has its own mileposts and exits except for the concurrency with I-15, which uses the mileposts and exits from I-15. ^ a b Adderly, Kevin (January 19, 2012). 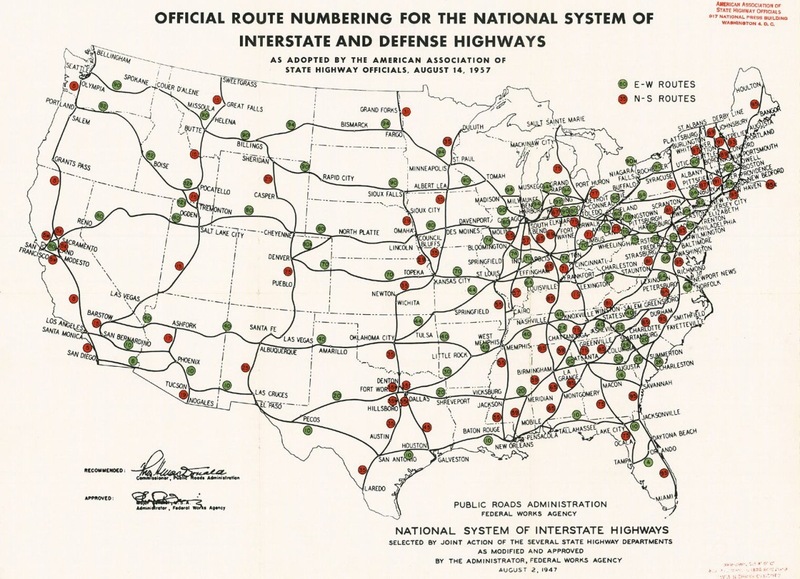 "Table 1: Main Routes of the Dwight D. Eisenhower National System Of Interstate and Defense Highways". FHWA Route Log and Finder List. Federal Highway Administration. OCLC 47914009. Retrieved December 25, 2013. ^ National Highway System: Utah (PDF) (Map). 1:772200. Federal Highway Administration. November 18, 2013. Retrieved December 25, 2013. ^ Staff (2012). Traffic on Utah Highways (PDF) (Report). Utah Department of Transportation. p. 15. Retrieved December 25, 2013. ^ Staff (2012). Truck Traffic on Utah Highways (PDF) (Report). Utah Department of Transportation. pp. 14–15. Retrieved December 25, 2013. ^ Tooele County (Map). 1:29040. General Highway Map. Utah Department of Transportation. 2005. p. 5. Retrieved December 26, 2013. ^ a b c d e f Google (December 25, 2013). "Interstate 80 in Utah" (Map). Google Maps. Google. Retrieved December 25, 2013. ^ Staff. "Danger Cave". Guide to Historical Attractions. Tooele County. Archived from the original on March 8, 2013. Retrieved December 30, 2013. ^ Copyrighted Official Map (Map) (701 ed.). California-Oregon-Washington Tourist Association. 1927. Retrieved December 26, 2013. ^ Utah Road and Recreation Atlas (Map) (2002 ed.). 1:250000. Benchmark Maps. 2002. p. 40. § G1-12. ISBN 0-929591-74-7. ^ Radbruch, Don (January 2004). Dirt Track Auto Racing: 1919-1941 - A Pictorial History (2nd ed.). Jefferson, NC: McFarland & Company. pp. 78–79. ISBN 9780786417254. Retrieved December 26, 2013. ^ Griggs, Brandon (2007). Utah Curiosities: Quirky Characters, Roadside Oddities & Other Offbeat Stuff. Morris Book Publishing, LLC. p. 149. ISBN 978-0-7627-4386-5. Retrieved December 27, 2013. ^ Tooele County (Map). 1:29040. General Highway Map. Utah Department of Transportation. 2005. p. 6. Retrieved December 26, 2013. ^ Salt Lake City — South (Map) (90 ed.). Sectional Raster Aeronautical Charts. Federal Aviation Administration, AeroNav Products. October 17, 2013. ^ Tooele County (Map). 1:29040. General Highway Map. Utah Department of Transportation. 2005. p. 7. Retrieved December 26, 2013. ^ Tooele County (Map). 1:29040. General Highway Map. Utah Department of Transportation. 2005. p. 8. Retrieved December 26, 2013. ^ a b Salt Lake County (Map). 1:22440. General Highway Map. Utah Department of Transportation. 2005. Retrieved December 26, 2013. ^ Hamblin, W Kenneth (1992). Roadside Geology of U.S. Interstate 80 Between Salt Lake City and San Francisco. American Geological Institute. p. 42. ISBN 9780913312438. ^ Arave, Lynn (November 16, 2009). "Holy smokes: Kennecott smelter, Utah's tallest man-made structure, to turn 35". Deseret News. Salt Lake City. OCLC 367900151. Retrieved December 25, 2013. ^ "Motorists Should Avoid Spaghetti Bowl this Weekend". KSL-TV. Salt Lake City, Utah. October 3, 2003. Retrieved December 26, 2013. ^ Arave, Lynn (July 14, 2006). "Prison once stood where park now is". Deseret News. Salt Lake City. OCLC 367900151. Retrieved December 26, 2013. ^ Map of Strategic Routes between Salt Lake City, Utah and California (Map). 1:2500000. Cartography by Matthews-Northrup Works. Lincoln Highway Association. 1923. OCLC 36006905. Retrieved December 26, 2013. ^ Official Highway Map (Map). Utah Department of Transportation. 2011. Salt Lake City, Ogden, Provo & Vicinity (Wasatch Front) inset. § D5. Retrieved December 26, 2013. ^ "Church History: Golden Pass Road". The Church of Jesus Christ of Latter-day Saints. Intellectual Reserve. Retrieved December 26, 2013. ^ Davidson, Lee (January 7, 2014). "UDOT launches variable speed limit system on I-80 in Parleys Canyon". The Salt Lake Tribune. OCLC 8086936. Retrieved January 20, 2014. ^ Balaz, Christine (June 2, 2009). An Explorer's Guide: Utah (1st ed.). Woodstock, Vermont: Countryman Press. p. 87. ISBN 9780881507386. Retrieved December 28, 2013. ^ Wilson, Arnie (2007). Ski Atlas of the World. London: New Holland Publishers. pp. 216–221. ISBN 9781845374679. Retrieved December 26, 2013. ^ Historic Union Pacific Rail Trail (Map). Scale not given. Utah Department of Natural Resources. Archived from the original on December 27, 2013. Retrieved December 26, 2013. ^ Summit County (Map). 1:22440. General Highway Map. Utah Department of Transportation. 2005. p. 2. Retrieved December 26, 2013. ^ Summit County (Map). 1:22440. General Highway Map. Utah Department of Transportation. 2005. p. 3. Retrieved December 26, 2013. ^ Utah Writer's Program (Utah State Institute of Fine Arts); Works Progress Administration (1945). Utah: A Guide to the State (2nd ed.). p. 354. ISBN 9780403021932. Retrieved December 27, 2013. ^ Lee, Willis T.; Stone, Ralph W.; Gale, Hoyt S. (1916). Part B. The Overland route: With a Side Trip to Yellowstone Park. Guidebook of the Western United States. United States Government Printing Office. p. 85. Retrieved December 27, 2013. ^ Crain, Jim (September 1, 1994). California in Depth: A Stereoscopic History. Chronicle Books. ISBN 9780811804233. Retrieved December 27, 2013. ^ Patrick, Kevin J. "15 - Lincoln Highway in Utah". Lincoln Highway Resource Guide. Indiana University of Pennsylvania. p. 191. Archived from the original on July 27, 2010. Retrieved January 15, 2010. ^ Hokanson, Drake (1999). "Salt Lake City to San Francisco: Desert, Mountain and Sea". Lincoln Highway – Main Street Across America. University of Iowa Press. p. 63. ISBN 0-87745-676-3. Retrieved January 15, 2010. ^ Staff (March 2010). Parley's Canyon Trail: Feasibility Assessment Report (PDF) (Report). Salt Lake and Summit Counties. p. 15. Retrieved December 30, 2013. ^ United States System of Highways Adopted for Uniform Marking by the American Association of State Highway Officials (Map). 1:7,000,000. Cartography by U.S. Geological Survey. Bureau of Public Roads. November 11, 1926. OCLC 32889555. Retrieved December 18, 2013. ^ Texaco Road Map Idaho, Montana, Wyoming (Map). 1:1,774,080. Cartography by Rand McNally. Texaco. 1937. § M-8. OCLC 52950564. Retrieved December 26, 2013. ^ Highway Map of Utah (Map). 1:1203840. Cartography by H.M. Gousha Company. Shell Oil Company. § E4-5. Retrieved December 26, 2013. ^ State of Utah (Map) (1959 ed.). 1:500000. United States Geological Survey. 1958. Retrieved December 26, 2013. ^ a b "America Celebrates 30th Anniversary of the Interstate System". U.S. Highways. Federal Highway Administration. Fall 1986. ^ Murrie, Matthew; Murrie, Steve (October 18, 2010). The First Book of Seconds. Avon, Mass. : Adams Media. p. 79. ISBN 9781440510670. Retrieved December 30, 2013. ^ Staff (August 25, 1986). "Around the Nation — Transcontinental Road Completed in Utah". The New York Times. Associated Press. OCLC 1645522. Retrieved May 13, 2013. ^ "72-4-207: The Purple Heart Trail". Utah State Legislature. 2002. Archived from the original on December 27, 2013. Retrieved December 26, 2013. ^ House, Dawn (August 2, 2004). "Purple Heart monument to be dedicated at HAFB". The Salt Lake Tribune. OCLC 8086936. Retrieved December 26, 2013. ^ Staff (July 31, 2008). "I-80 bridge replacement complete; State Street reopened". Salt Lake City: KSL-TV. Retrieved May 13, 2013. ^ Staff (December 17, 2012). Route 15 (PDF). Highway Reference (Report). Utah Department of Transportation. Retrieved December 25, 2013.